Because we use non invasive leak detection methods our services workout to be extremely cost effective, this is because hours of labour are saved in the leak detection process. Invasive methods of leak detection require the lifting of flooring, digging of the ground along the path that the leaking pipe is thought to run. This is obviously a time consuming and therefore costly process. In addition to this, you are normally required to hire a plumber to repair the actual leak once it has been located. Which water leaks can you find? 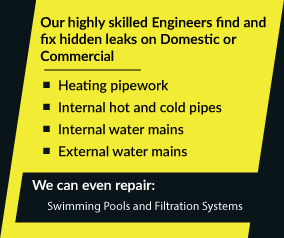 We specialise in locating water leaks under floors, on central heating systems, on water mains, hot and cold water feeds. The list is almost endless, but if you have a water leak in a property then we should be able to help you – Simply give us a call on 0800 731 3843 to find out. Are you able to locate an external water leak? We have a specialist crew who pinpoint the location of external water mains leaks every day. Using a complete range of specialist leak detection tools, equipment and expertise we are able to accurately locate water on long and short stretches of water mains. Are you able to repair my leak once you have found it? Our teams are all highly experienced plumbing and heating engineers, many of whom have been tracing and repairing water leaks for many years. Do you have any testimonials for your leak detection service? Yes, we have over 140 reviews on Which trusted traders with a glowing 4.6 star out of 5 rating! I am a landlord and my property is elsewhere in the UK, are you able to help? Sure, we serve the majority of the UK from our base in High Wycombe, Buckinghamshire and via our network of engineers nationwide. How can I enquire and have you come solve my problem? Call one of our small & friendly team on 0800 731 3843 and they will be sure to listen to your problem and you will discover if we can help you.